Laura Gerding has been training with MET-Fit for the last several years, and is one of our most consistent and dedicated members. This remains true 28 weeks into her current pregnancy. It has been a pleasure getting to train Laura during her pregnancy, ensuring that her exercise is as safe as possible for both Laura and her baby. We are so excited for Laura and her growing family, and are honored that she has trusted us with her health! Below you can read more about Larua and her experience at MET- Fitness. Tell us a little about yourself! (work, family, hobbies). I work on the marketing team at Missouri Employers Mutual. In my free time I like going to metFit classes, trying out a new recipe in the kitchen or planning fun stuff with our five year old, Eloise. What brought you to MET-Fitness? I was looking for something to help me be accountable and make the most of my time in the gym. Plus, working out alone isn't as fun! What are a few of your personal goals that you hope to accomplish here? A good portion of my gene pool fights the scale on the regular. Always has. So I like to put up a good fight. I know that getting stronger, and challenging my body with conditioning really helps. I don't ever want to take my mobility for granted, or lose it! What has been something you've enjoyed about METFitness? The community of people from all ages and backgrounds. I never feel limited in my ability to try something, and I always feel that when I do, I know I'm being the safest I can be. The positive, encouraging attitude is really refreshing. What is something you've struggled with in regards to fitness in the past? Time! And Staying motivated and not getting bored with my routine. It's hard to think of things to do, and do them with proper form, without a little help. Who is someone who motivates you in the gym? Do you have a fitness inspiration/motivation - if so, who? My daughter motivates me. I want to set a good example for her. And my Dad, who is alive and well, had a heart attack at 39. So I grew up knowing that taking care of my heart, and exercise, is important. What is a fun fact about yourself you'd like to share? I really love deadlifts. Especially straight leg deadlifts. They are my favorite- seriously. Can you tell us about your experience MET-Fitting while pregnant? My first pregnancy, I worked out with a trainer and I knew with this one I needed a partner to help me again. 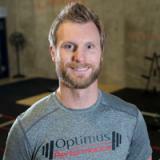 MET-Fit and the trainers here help me train safely, offering modifications when needed. They make me feel like I'm still me and I can still do things, even though I'm pregnant!